Fremantle’s Bathers Beach was as crowded as a jar of anchovy today when thousands visited the Seafood Festival. Celebrity chefs showed how to best cook seafood and there were wine and olive oil tastings and yummy food on offer. The cajun prawn sliders and the crumbed sardines in a mini breadroll were delicious, but the mussel paella looked stunning as well. It was a day of family fun and the perfect weather for it at Fremantle’s most gorgeous little beach. 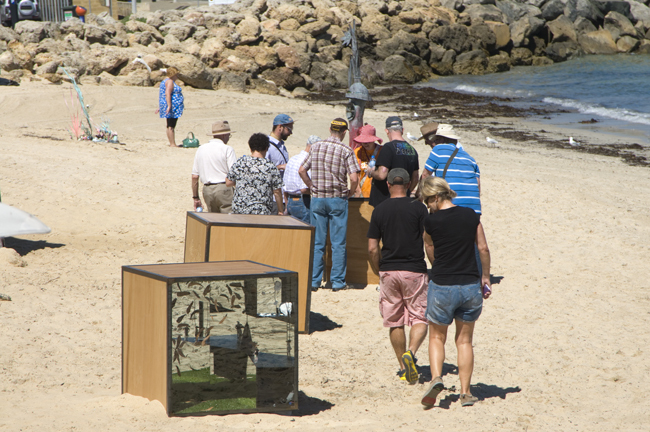 There are only two days left of the Fremantle SCULPTURE@BATHERS, so come along on the weekend and enjoy art by 75 Western Australian artists. Workers have started setting up for Sunday’s big Seafood Festival so that is another reason to come to Bathers Beach. The KELP BAR at Kidogo Arthouse is open today and Saturday from 4pm and from midday on Sunday. it’s the best and most arty spot in town to have a cold beer or glass of wine. 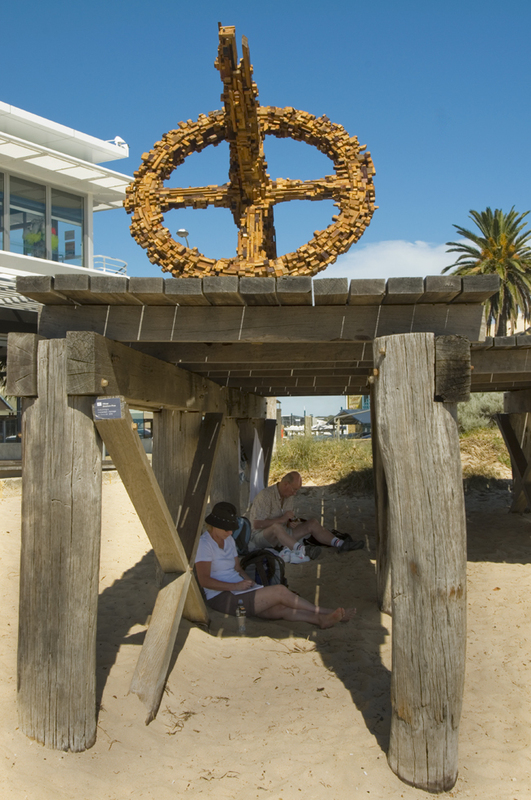 This stunning artwork Homage to Chris Hill by Oliver Stretton-Pow sits on the site of the former one kilometre-long jetty at Bathers Beach and is one of the 75 exhibits in SCULPTURE@BATHERS. The jetty gives perfect shade to those who like to be on the beach but not in the full sun and that makes for an interesting photo. 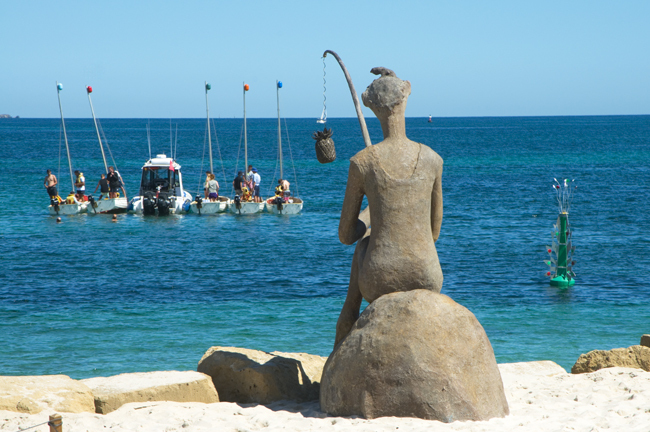 Sculpture at Bathers runs till Sunday evening and the grand finale is the Fremantle Seafood Festival, with many stalls, live music, cooking demonstrations by famous chefs, etc. at Bathers Beach and the Fishing Boat Harbour. Entry is free and the weather forecast good, so bring the family, friends and try the new fusion delicacy of art and seafood.